Barack Obama Co-Sponsored a "Stand Your Ground" bill as a Senator in Illinois-Truth! - Truth or Fiction? Barack Obama Co-Sponsored a "Stand Your Ground" bill as a Senator in Illinois-Truth! Barack Obama Co-Sponsored a “Stand Your Ground” bill as a Senator in Illinois-Truth! 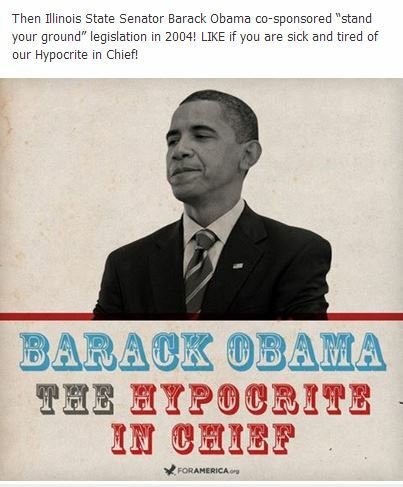 This is a Facebook posting that alleged that President Obama, while serving in the Illinois State Senate, co-sponsored a “stand your ground” bill. According to a July 22, 2013 article by the Washington Times, then Senator Barack Obama co-sponsored SB-2386 that amended the Illinois Criminal Code of 1961. “Stand your ground laws” exist in 22 U.S. states and have become controversial after a Florida jury acquitted George Zimmerman. Zimmerman was charged with the second degree murder of Trayvon Martin after an altercation on the streets of Sanford, Florida on February 26, 2012. The Facebook post appeared on the fan page of ForAmerica, a traditional values group chaired by L. Brent Bozell of the Media Research Center. Jesus named the Antichrist—and it’s Barack Obama-Fiction! Joel Osteen Endorses President Obama- Fiction!